The following was written by Neal Turner, CSI, CCPR, LEED®AP. Neal is the Manager of Gymnasium Equipment for Draper, Inc. Neal is a member of the Construction Specifiers Institute (CSI) and holds the Certified Construction Product Representative (CCPR) designation from CSI. Neal is also a LEED® AP. There are so many details that need to be addressed when planning a new worship facility gym that there are a couple of details that are often overlooked. On the surface this sounds like a pretty silly question. Everyone knows what goes in a gymnasium. There should be basketball backstops, volleyball equipment, and maybe some wall-mounted P.E. equipment such as chinning bars and horizontal ladders. But choosing the right gym equipment is more complicated than that. There are many options out there designed to fit different needs, so the committee planning your facility should sit down and talk about what is expected of your new gymnasium. 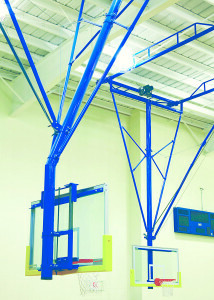 Basketball backstops are probably the first thing discussed when designing a new gym. There are several options depending on what you want to do in your gym. Wall, Ceiling, or both: If there is room in your gym, ceiling suspended backstops allow for more seating and “safe areas” around the main court. Wall mounted units make good practice side courts. Folding backstops: Both wall-mounted and ceiling-suspended can be “folded” up and out of the way using winches. This allows for multiple uses of a facility—other sports and even non-athletic events can benefit from the overhead space cleared by getting the backstops out of the way. Having volleyball and other sports equipment means having options, and providing activities for other groups or skill levels. 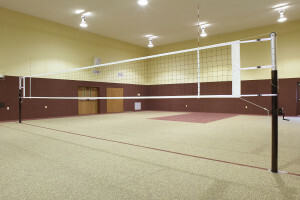 With built-in floor anchors and covers, it can be a simple task to set up a section of the gym for volleyball and other activities. There are also practice cages available that can be raised above when not in use, then lowered to allow batting practice without endangering others using the gym. How often is a gym used for only one thing at a time? Often there are times when it would be nice to be able to host multiple activities simultaneously. To accomplish this, consider gym divider curtains. 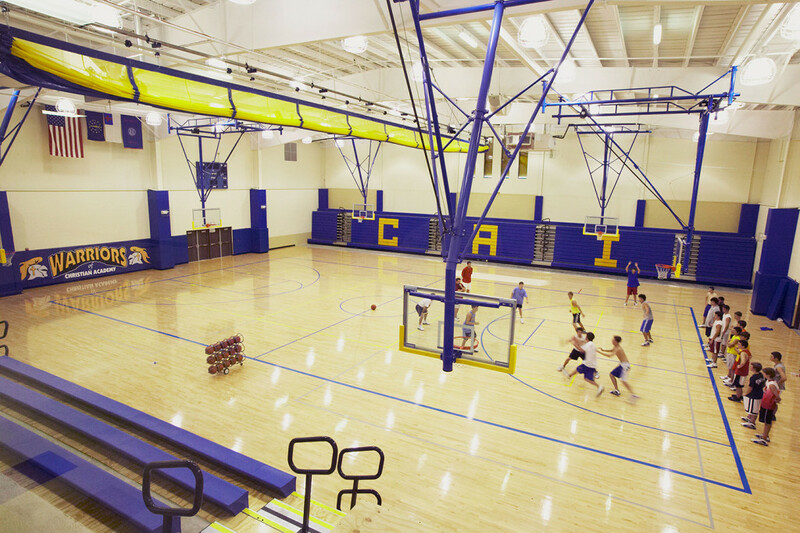 Divider curtains are easily lifted out of the way when not in use; in addition to allowing different athletic activities, curtains also allow you to divide your facility into smaller spaces to be rented to or used by outside groups, providing additional revenues. 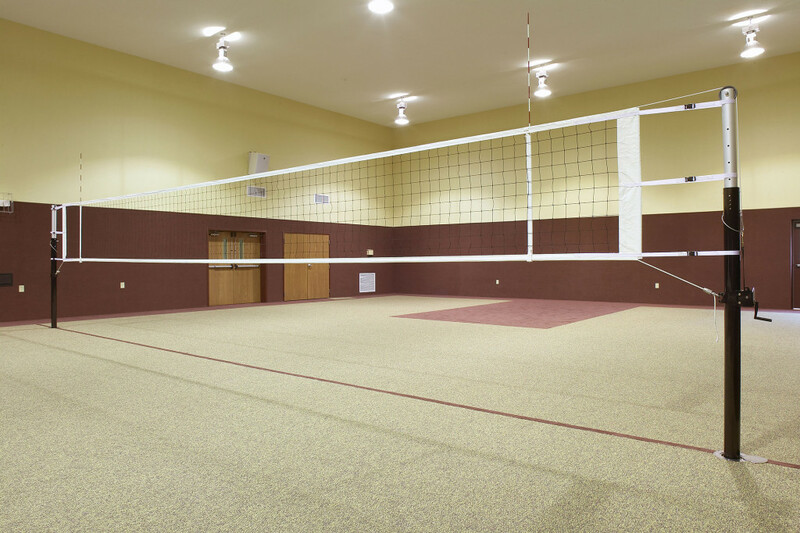 Unless you are planning to build a facility that will be used for one sport only, you might want to consider floor covers. Floor covers protect your hardwood floor during non-gym activities, and are easily rolled onto carts to be wheeled away into storage. For strength development and testing, you should also consider physical education equipment. Climbing ropes, chinning bars, and horizontal ladders can be mounted in unobtrusive places, providing more activities without taking up a lot of space. Like it or not, people can be injured when participating in sports. Make sure to take into account the proximity of the walls to the activity areas. Wall pads are a key part of your gym protection plan; they should go not only on outer walls, but also around supportive pillars and posts. 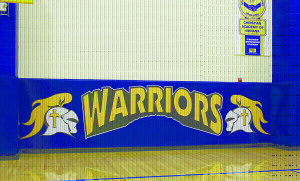 Padding should also be placed on backboards and volleyball or tennis posts. Protective covers for clocks and other items are also available. Choose manufacturers who can provide all necessary gymnasium products. Allowing local representatives or general contractors to piecemeal this equipment from multiple sources normally leads to added cost, coordination problems and confusion when future service or warranty issues may arise. Choose manufacturers that offer extended warranties. Don’t accept just a one year warranty. You should expect a lifetime warranty for backboards and warranties of 25 years on support structures, five years on winches and divider motors, five years on safety straps, three years on breakaway goals, eight years on bolt-on edge padding, 10 years on volleyball posts, and five years on volleyball winches. There are at least three manufacturers who offer standard warranties like these. Accepting a sub-par warranty could come back to hurt you later. Look for manufacturers that provide powder coat finishes and options for colors. Powder coat will insure the equipment looks like a finished product, arrives in good condition and will look good for years. 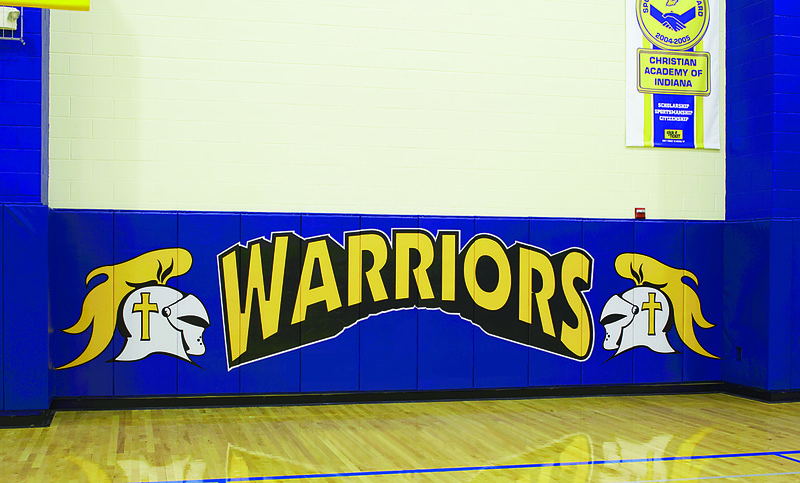 Gymnasium equipment has evolved from “you can get any color you want as long as it is flat black primer.” Today’s color options allow equipment to follow building schemes, match school colors or virtually disappear when folded against roof structure of the same hue. Accept only manufacturers that provide independent test results showing the strength and safety of their equipment. Hanging heavy gymnasium equipment overhead can lead to significant property damage, personal injury, or worse if clamps and fittings fail. 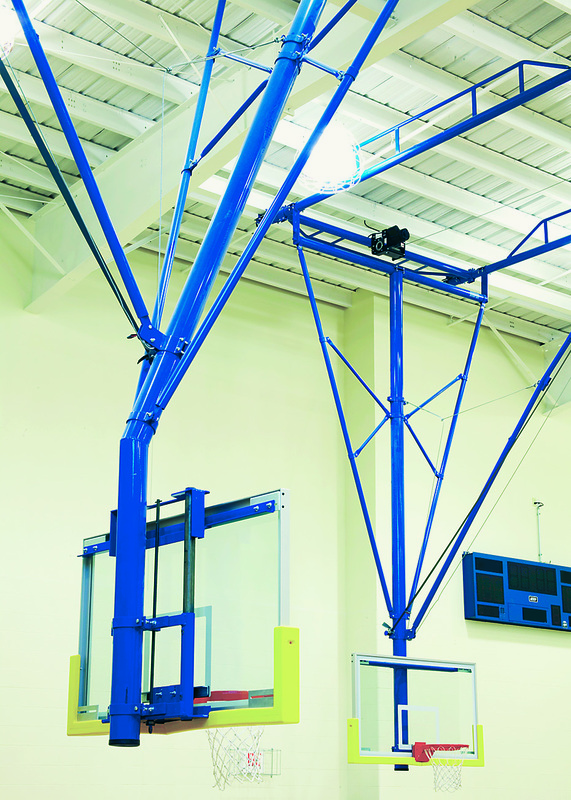 The best gymnasium equipment manufacturers can produce results from accredited testing agencies and calculated safety factors of at least 50 to 1. Do not accept equipment that may be unsafe. By considering these points when developing your plans for a new gymnasium, your job becomes easier and you will have a safe facility that will provide years of trouble free service.